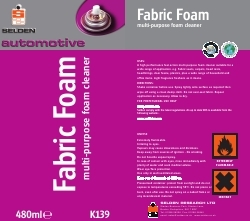 A high performance fast action multi-purpose foam cleaner suitable for a wide range of application. e.g. Fabric seats, carpets, head rests, headlinings, door fascia, plastics, plus a wide range of household and office items. Light fragrance freshens as it cleans.